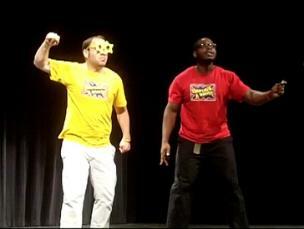 Improv Comedy is a very versatile art form that can be presented in just about any event. Our shows have played Broadway Size mega theaters up to 1500+ seats as well as large hotel Ball Rooms. Conversely the show works perfectly at intimate clubs, student activities event spaces, hotel lounges, restaurants and even private homes. We can turn any space into a comedy club. Or with simple sound help (wireless lapel microphones) the otherwise intimate show becomes an inexpensive alternative to Broadway Shows, like so many off-Broadway revues (“Forever Plaid”, “I Love You, You’re Perfect, Now Change!” or “Forbidden Broadway”). Only Improv comedy usually appeals to both the Off Broadway crowd and a younger comedy crowd. Best part about Improv for a presenter / event planner, there is far less overhead than a scripted show. Lack of props, sets and script removes 1000s in royalties and set up staff needs. In many cases you just have to turn on the lights and we are ready to go. And we bring you actors from TV, Film and Broadway at a fraction of the cost. This show is geared for adults – full of smart and witty takes on today’s hottest topics – but teen friendly and clean enough for any regional theater. (PG-13 equivalent to movies – edgy but no cursing). The show has played colleges and theaters nationwide. The show literally ran Off Broadway for 18 months 2009-2011 under AGVA contract. Currently it plays weekly at the Broadway Comedy Club in times Square. Book for your children’s series at theaters, libraries, community centers and more. the has run weekly in Times Square at top Comedy Clubs (The Improv, Laugh Factory and currently The Broadway). 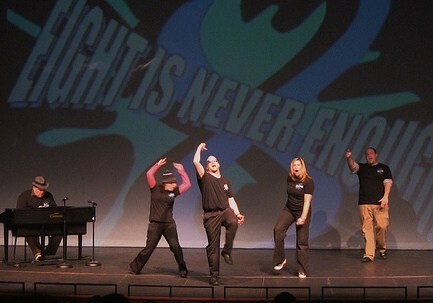 The even cast performs for school assemblies and camps. Performed by the same cast, this show can help off set the costs of a prime time show of LMAO. Book a midweek show and invite local schools for a field trip. Our NYC company hosts 2-5 schools/week. Book on the weekend and add a matinee to your children’s theater series. Many presenters have completely off set the cost of an evening program with grants and ticket sales to the students and family productions. Even better book with a neighboring school or theater and save. With the cost of travel being so high, we can do huge discounts for block booking. We have appeared twice now at the 400-seat Gerold Opera house in Wayauwega, Wisconsin. Weyauwega is one of America’s smallest towns. Main street, both blocks, still looks like the 1950s. The surrounding ares older. But we sold out two shows (one each in 2008 and 2013). And we have already been asked back in 2015. The theater usually hosts community theater, local professional artists in residency, community events and school groups. Both trips the theater teamed up with the local school system. We presented shows and workshops at the Elementary, Middle and High School. The daytime activities not only subsidized the evening main stage event, but they served to promote as well. Theater companies at the school sold out the space and in turn raised a little money for their own programs. The theater made a profit from the box office alone and family audience bought a lot of popcorn, candy and sodas. Synergy at its best!!! Based on out New York City the shows tours DC to Boston every month. Fall 2015 is set for our 3rd Mid West tour. The shows has already traveled as south as South Carolina and West to Nebraska and North to Maine and the Canadian Border of Upstate New York. Find out why more than 5000 audiences have loved this shows since 2002.